From the front page of Brighton & Hove Council's free newspaper. That word, invariably connected to public art: accessible. What does it mean? The Festival is held once a year across May, heralded on the first Saturday of the month by the noisy, pavement-blocking Children's Parade that disturbs my trawl of the North Laine's secondhand bookshops. Otherwise I never notice that the festival is on, so promotion of these "arts hubs" must be irreproachable in its motivation. 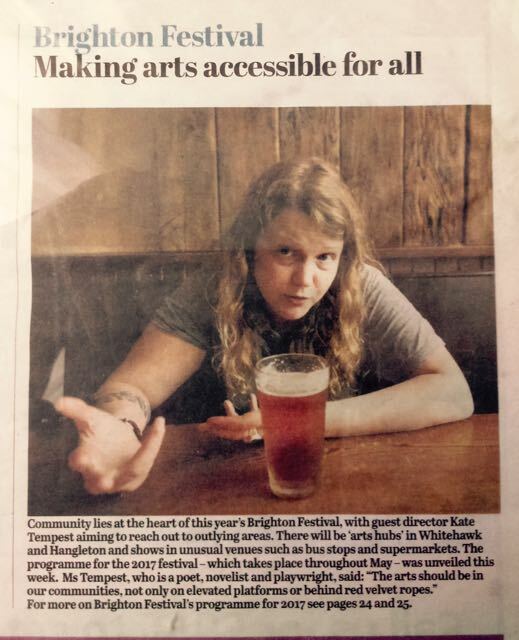 After all, as Kate Tempest says in the flyer pushed through each resident's letterbox, art should be "no big deal – just life itself". It's central to her theme of giving people's lives back to them through art: "We are so busy being human, we can lose touch with how bright and clear life is". She recommends attending as many events as possible and treating it "like you are a pilgrim on a quest". In doing so, you might find something that connects you to "a deeper and more soulful level with the truth of lived experience". What strikes me in this familiar appeal to accessibility and relevance is the allusion to religious belief and practice, not only in her choice of words but also in her Pint at Emmaus pose. Isn't this what is most removed from the everyday? Of course, the choice of words might be the casual coincidence of marketing hyperbole and democracyspeak, but it does stand out. In what might also be a coincidence, this month I began reading Eamon Duffy's monumental study of traditional religion in England between 1400 and 1580; that is, before and after the English Reformation. 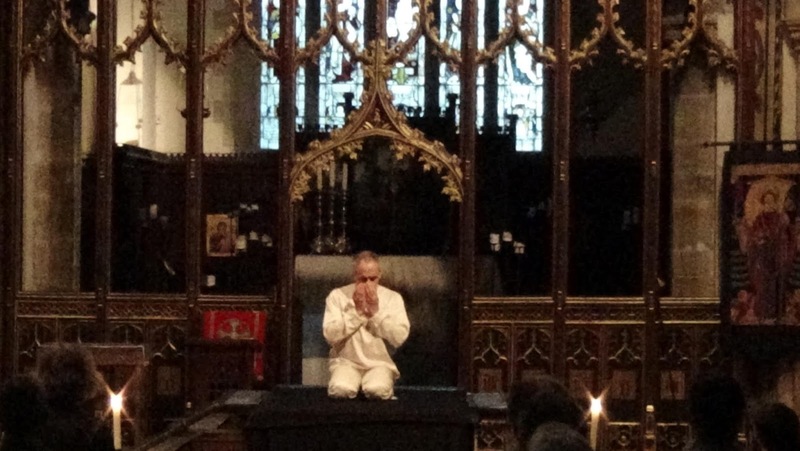 The Stripping of the Altars describes in detail how the Catholic liturgy gave shape to the lives of the ancestors of those to whom Kate Tempest is appealing. It outlines a religious calendar packed with candlelit ceremonies and elaborate processions, with the four main ones embracing pre-Christian festivals marking the turning-points of the seasons. We have only to imagine the transformation of modern society around Christmas multiplied throughout the year to recognise how this would not only knit a community together but give a context to individual devotion. Reading it, one becomes aware of an alien world whose ruins are all around us. The ghost of such festivals appeared to me as I was trying to cross a road blocked by the Children's Parade or, more accurately, the parents watching from the pavement. The children were excited to be dressed up and ready to march behind a group-made float (the one I saw was a galleon made from turquoise crepe). As they banged their drums and blew their whistles, their natural urge to show off was released and legitimated by the event. Any resentment I felt about the noise drowning out the podcast in my earphones was mitigated by this brief apprehension of the world of my ancestors. For all the relevance to current social and political concerns of the festival's events – Tempest's own performance is "set against a backdrop of global crisis" while a dance event (contain your excitement) "focuses the subjective and objective gaze within private and private spaces" – this simple procession seemed more authentic and effective. I haven't attended a main festival event since 1993 (an Elvis Costello gig), for the same reason I have never willingly attended church. The Books and Debate category I find especially repellent because of its overt lack of literature. 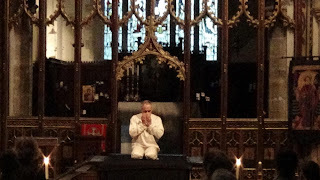 However, last year I did enter a thousand-year-old church to see a fringe performance by Alain Louafi of Stockhausen's Inori. It was the first time I'd heard his music on such a scale. For 73 minutes (the introduction was precise) Louafi mimed to the music, making gestures synchronised according to the instructions Stockhausen had given him. Sometimes they were prayer-like, sometimes not. Here is a review of the event. All I can say now is that it was like witnessing the religious ceremony of an alien race. Would this be considered 'inaccessible'? It wasn't a question I asked at the time but might be why a few people walked out during the performance. If so, they would have found the night sky inaccessible in the same way. Before I had finished reading Mathias Énard’s Compass – the link goes to my review – I re-read Gabriel Josipovici’s 1993 novel In a Hotel Garden, perhaps because it has just been published in French translation and I wanted to remind myself of why I read it so often in the mid-1990s, or perhaps because I felt that, despite its many qualities, something was missing from Compass and this was the first place that occured to me to look for its name. I assumed it wouldn’t hold up to memory and fade in estimation to match the colours on my copy's spine because many of the novels that followed – Moo Pak, Goldberg:Variations, Everything Passes, After and Infinity – are more adventurous or unusual in form and content. Could it be really as special as I remembered? In a Hotel Garden is certainly a very quiet novel, told almost entirely in dialogue and set in everyday situations, which one reviewer compared to those in the gentle comedy of Posy Simmonds’ cartoons of English middle-class life. It begins with two friends chatting while walking a dog on Putney Heath. Ben tells Rick about his holiday in the Dolomites with his girlfriend Sandra, in particular about meeting Lily, an Englishwoman staying in the same hotel. His curiosity is piqued because she hestitates to explain her reasons for visiting northern Italy. At first she says she needed space to think about her relationship with her partner Frank in London, who she would probably leave if she didn't love his dog so much. Ben has the chance to learn more because, as Sandra struggles to adapt to the altitude, he spends more time with Lily, chatting over coffee and then trailing in her wake on a day-long walk in the mountains. However, rather than the beginning of a traditional love triangle, the drama surrounds Lily’s reticence and Ben's persistence in trying to get her to talk. The garden in Italy, she would say. I don’t know how I imagined it. The word garden took on a kind of magic for me. The words hotel garden. The words garden in Italy. The garden, she would say. The hotel garden. Later, we learn that the reason the young man stopped writing was because he and his family were killed in the Holocaust. So this is a Jewish story too and Lily’s wish to find the garden becomes more complicated than the usual stuff of romance novels. Indeed, the novel's epigraph is from midrash on Genesis 39 – "Potiphar's wife too wished to belong to the history of Israel". Back home in London, and after much deliberation, Ben contacts Lily and they meet up beside the Thames and it is here she tells him that what happened to the Jews in the past came alive for her through the young man in the garden. It came to me at the airport, she says. Why it was so important, that garden. It's as if that day their whole lives were present to them, their lives before and their lives after. Everything that would happen and not happen and all that would happen and not happen to their descendants. Everything. Enclosed in that garden. Held together by the trees and the wall and the silence. That's why I had to go there. To feel it for myself. She shakes Ben's hand, says goodbye and crosses Hungerford Bridge, leaving him alone and as confused as ever. What had happened between them? Would she want to see him again? Was he only ever an inadvertent means to work through her personal issues? The answer might not be present to Ben because it lies in the garden of the novel. When they're talking over coffee about the sights in Siena, Ben asks Lily if she had seen the mosaic in the cathedral, as it had always been covered up whenever he visited. 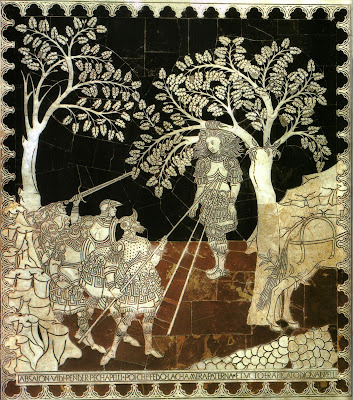 Lily has: it depicts Absalom, third son of King David, hanging from a tree, his hair caught in low-hanging branches as he tried to escape from a battlefield. 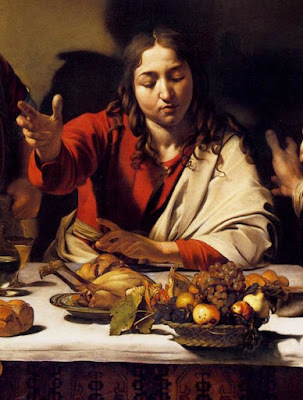 Lily says the rabbis point out that he who had gloried in the length and beauty of his hair to win popularity and undermine his father died for the same reason. Lily wonders if life can really have a pattern like that, and if we can become aware of it while in the middle of it. She decides we cannot. – And I can’t get over this business of speech, he says. One talks about things that could change one’s life but it’s just like talking about the weather. In a Hotel Garden is very quiet novel because the central drama indeed appears no more pressing than the weather, and this is because we too are at a certain remove whatever the illusion of intimate access novels appear to allow. It should be no surprise then that Josipovici's novels, especially those as quiet as this, often provoke ambivalence because, while it isn't 'experimental' in any obvious way and cannot be patronised as such, neither is it a hefty tome with large characters or intense action. Indeed, it's not difficult to imagine a 500-page historical fiction following the parallel lives of Lily's grandmother and the young man, their brief intersection and their very different fates, with all the period detail you'd expect and with the holocaust narrative looming as large as a royalty cheque. And easy to imagine a keen reviewer telling us how it "tackles" themes of war, love and loss, and proves historical fiction "deserves more recognition". One might say these novels glory in life, and it's no coincidence that the novel Ben takes on holiday and fails to read is Henry James' The Ambassadors with its European setting, theme of liberation from a cramped culture and famous line "Live all you can, it's a mistake not to." If we assent to its demand, as so many do, hence its fame, why do we need its place in a novel to assure ourselves and others of its truth? What suggests itself is that, however much we valorise living all one can, whatever we experience, distance takes possession of it. Everything that happens is already a book, even if it is one as evanescent as Lily's standing in the hotel garden. That is, what she experiences there is itself a novel. Everything is enclosed there, held together by the trees and the wall and the silence. It's why she had to go there. I bought my copy of In a Hotel Garden on 9th February 1993. The date is written on the inside cover in red felt tip. 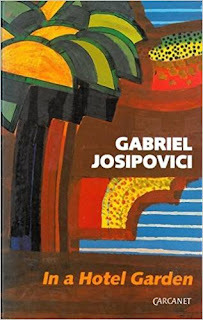 Fifteen days later, Josipovici appeared on BBC Radio 3 to discuss the novel with John Tusa, Howard Jacobson and Kate Figes. Tusa began by asking if the title was chosen because 'hotel' and 'garden' had special meaning for Judaism: hotel standing for dispersion and exile, garden for the Garden of Eden. 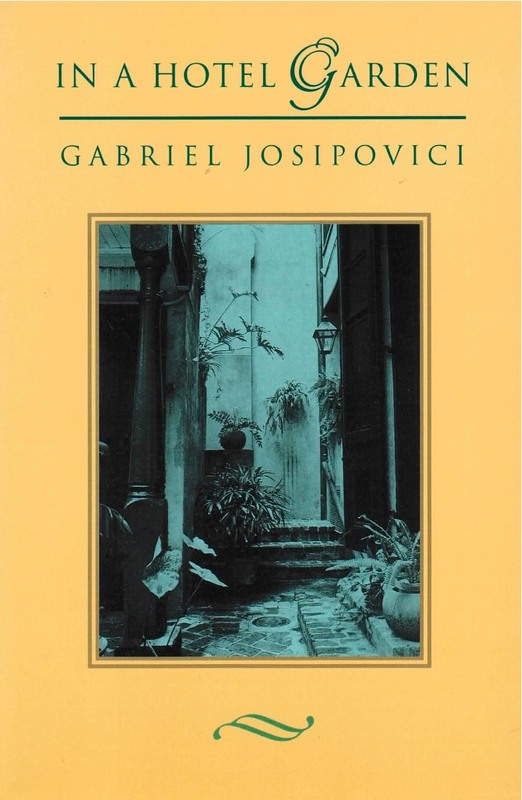 Josipovici was uncharacteristically fazed, so Jacobson asked if 'In' might have more meaning. He went on to say that he wrote the novel because, if he could say what he wanted to someone, he would say it to them in person and not write a novel. This adds an external displacement to those internal to the novel and substantiates the strange necessity of displacement, of writing fiction. "Fifteen days later" was Wednesday, 24th February 1993: the day Bobby Moore died, the day the BBC broadcast a production of Beckett’s Endgame featuring Charlie Drake, and the day I drank a half a bottle of vodka in an hour, something I had not done before or since. I have no idea how I managed to record the TV and radio shows, but I did, hence the detail included here. Re-reading it again after twenty years has been a revelation, much like Lily returning many times to Italy only to discover the reason late on, and much like the author's 1977 Migrations two years ago. The revelation is I think that a book as quiet as this is necessary to enable a certain kind of speech; a speech displaced from speaking. And this is why I quoted Dag Solstad at the beginning. What's intriguing about In a Hotel Garden is that what one cannot take away without dissolving the whole book is not in fact present. 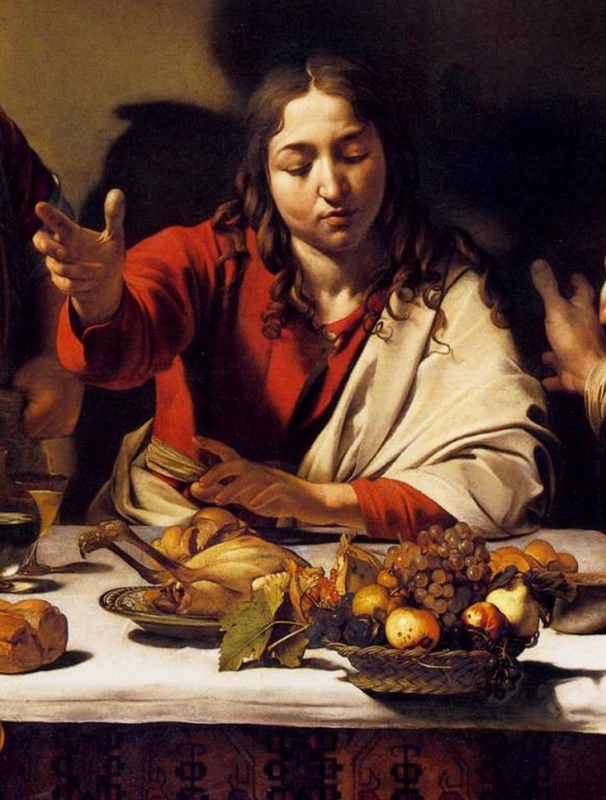 Its core quality is that the core is absent, or is itself an absence that seeks to be filled with speech, and it might be this that drew me back. 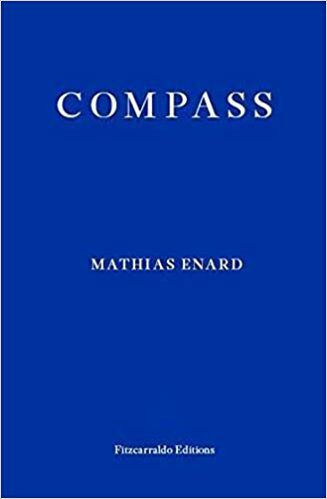 You will likely have already read many reviews of Mathias Énard’s novel: a “seductive narrative” (Irish Times) that consists of the Austrian musicologist Franz Ritter’s “insomniac monologue” (Economist) about “scholarly adventures” (Guardian) and Sarah “his unrequited love” (New Republic) that “has appeared on our shores at precisely the right time” (Washington Post) because it is “an encyclopaedic survey of the intersections between oriental and occidental high culture” (Literary Review)”. And you might also have noticed that it has impressed many other readers – “a book that I could vanish into forever” (Times Flow Stemmed) – and inspired them to seek out the many books it refers to and the many pieces of music it describes – “My ‘to-read’ stacks have grown by leaps and bounds this past week” (Book Binder’s Daughter). The lone dissenting voice complains that despite such riches “we are left with no key or route, no governing perspective ... no source of interest beyond the torrent of allusive gags and proper nouns” (New Statesman). Leo Robson suggests that its “fabulous wealth of cross references” (Irish Times) are instead the “fruit of marathon library sessions” and that, for instance, (my example) expanding on an anecdote about the villa in Tehran of a professor who sought and failed to memorise the 4,000 lines of Hafez’s Divan is either a cover for the “sturdiness of conception” that this novel lacks or a satire on the world of academia “with its specialist journals, university sub-departments, colon-heavy lecture titles and peer-reviewed articles”. This doubt about what is otherwise supremely easy and pleasurable to read on a sentence-by-sentence level in Charlotte Mandell’s “symphonic” translation (Washington Post), very much the opposite of Robson’s claim that Énard’s books are “intransigently difficult to read,” emphasises the anxieties created by the juxtaposition of such content in a novel. The implicit assumption is that it is a gimmick. 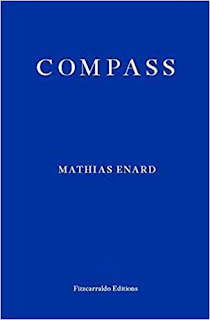 If Compass describes in detail how musicians have also partaken of Orientalism’s imperial embezzlement, then why has it taken a form usually reserved for intense descriptions of everyday life, such as Molly Bloom's or Clarissa Dalloway's? And, if that premise is so topical, why mix it up with stuff about a pitiful personal longing and opium addiction? Énard is himself an academic who has lived and studied in Syria, Lebanon and Iran, so why didn't he write a monograph for a university press instead? Perhaps the learning on display is really only the foregrounding of what other novelist call ‘research’, that attractive activity that here mitigates what is otherwise an indulgence of imagination, providing the reader with the material to suppress disbelief and reviewers the means to appease doubts about the value of fiction from the perspective of a daily newspaper, but, more importantly in terms of Franz Ritter's existence, also minimises the distressing situation he is in: floating between night and day, sleep and sleeplessness, illness and health, and exposed to his original fascination (the Orient and Sarah) as a compass is exposed to magnetism and trembles under its otherwise invisible influence. Marathon library sessions in the past might now help suppress the horrors of the present. The stories become an “endearingly futile attempt to ease his pain” (Irish Times); the pain of distance, the pain of loving someone and something that he knows, perhaps finally, can only ever remain on the other side of the world. Why else is he a musicologist, a discipline that seeks to turn what is closest to us, perhaps the most human, and yet what is also the furthest away, perhaps the most mysterious, into rational discourse? He is aware of the temptation, as he describes those in post-revolutionary Tehran who didn't play up to the new republic and "suffered from chronic depression, intense sadness", taking refuge in "erudition, imaginary journeys and artificial paradises”. As readers, we become aware of how this is also our temptation. Franz Ritter, this dark knight of the soul, longed for Sarah even when she was present, and the 475 pages contain examples of their exchanges of letters and emails, emphasising how much of Compass is a construct of written words rather than evidence of direct access to a stream of thoughts, so that Énard’s occupation of Franz’s consciousness becomes subject to the same concerns about imperial pilfering, and thereby so too the novel in general as a means to interpret and understand the world; a raid on the outside that remains outside despite the magnificent illusions of intimacy. The scholar who tried and failed to memorise the ancient poem says to know Hafez is “like having an intimate experience of love,” though his failure must mean the experience is one of incompletion, as hundreds of lines always escaped him: “Some appear, others go away. They compose a cloud of fragments that stands between Truth and me." This is of course is an apt summary of Franz Ritter's incomplete life as it approaches completion and of ours reading this novel. 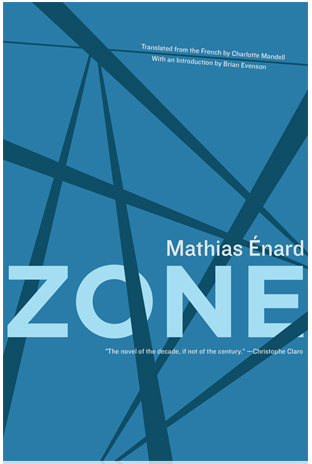 When I reviewed Zone, Énard first novel to be translated into English and which did not receive anything like the attention it deserved, I noted how the sentimental narrative that interrupts the torrent of atrocity stories reminds the reader of how, despite the overwhelming nature of the content, we still seek a redemptive quality in novels, which might be as simple as the utility of knowledge suggested by intimacy, even if that is intimacy with atrocity and trauma. 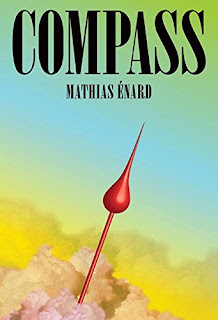 Of the thirteen reviews I have seen of Compass, not all mention Zone but, of those that do, seven describe it in passing as a 'single-sentence novel' or a '500-page single-sentence novel'. I had assumed the reviewers hadn’t read it because one can hardly miss that page 291 alone has 16 sentences and page 437 has 18 – two places where the sentimental narrative appears. However, when I pointed this out, one reviewer said not only had he read Zone but he thought it wasn’t a misrepresentation, rightly pointing out that the publisher makes the same claim. Such indifference to the qualification of what might otherwise appear gimmicky by modifying our relation to what we have read until that point, appears to be happening with the reception of Compass, with the cloud of fragments indeed offering no obvious key or route, but yet offering a perspective, albeit the non-governing perspective of love and incompletion, with all the obsessive learning, delirium and bathos that implies.